Today is the BIG DAY! Hubby and I have been working since 2015 (4 years!) to get our kitchen makeover finished. We only have 1 project left to go – adding French doors – but I’d say that it’s ready for a big ‘ol reveal. When we moved into this house I knew that this kitchen would be a major project I wanted to tackle. I can’t even believe the difference! The journey has been so worth it. So are you ready to see the transformation?? First, let’s visit the BEFORE KITCHEN of doom. Dark, ugly, and outdated. Yes, this picture is from when we moved in but it is the only one I have that shows the full kitchen. And, yes, that is exactly what it looked like. It has in total taken us 4 years to almost complete this kitchen. And this is what it looks like today! 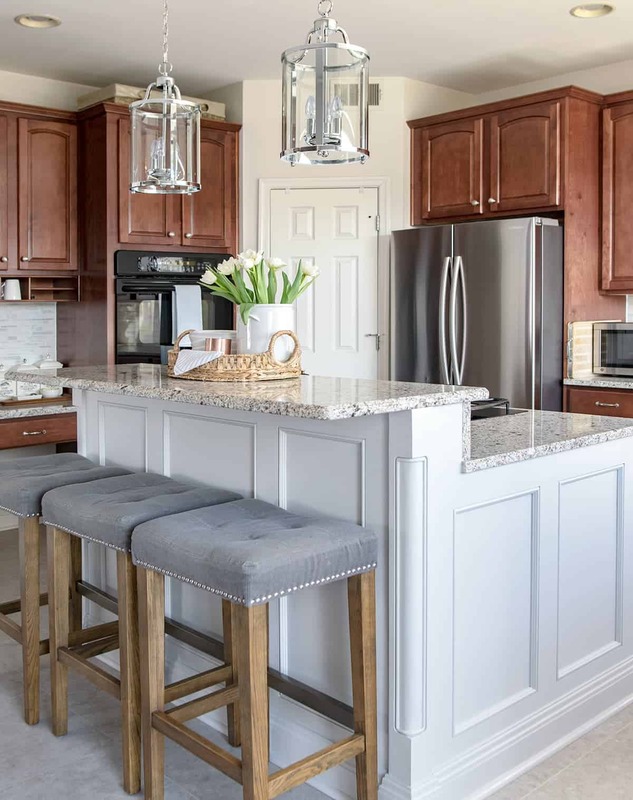 During Phase II (2018), we have changed out the bar stools, built an updated kitchen island (again), added new lights and changed up the accessories a bit. The finished breakfast bar with extension. We added on to the original island to make it more functional as this is this the main eating area for our family of 3. I loved the old bar stools functionally but they were in some desperate need of an update. Per hubby’s request, the cabinets have not changed. That was one of my compromises. However, in return, I got to do the accessorizing. The new, better fitting fridge is awesome! 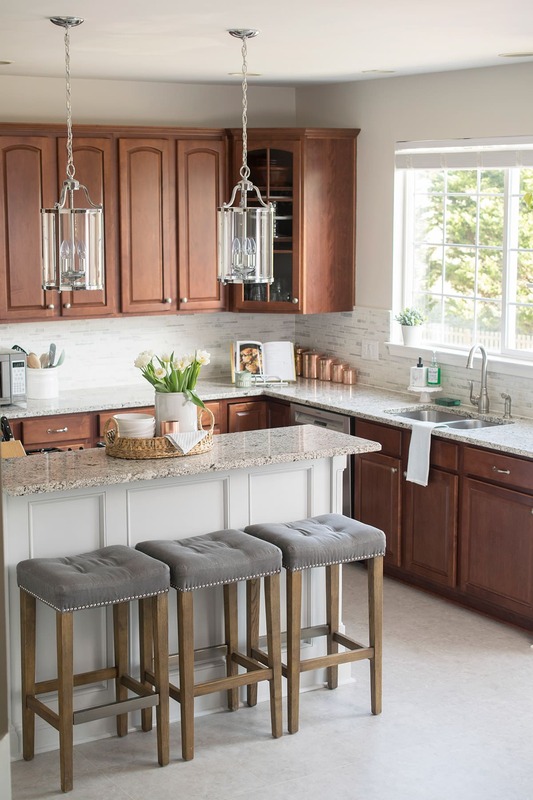 Even with the darker cabinets, the kitchen makeover makes this room much lighter and airy in feeling. Love It! They grey really brought out the richness of the cabinetry that was missing in the yellow/beige outdated scheme. I will totally take credit for that back splash, though! It’s a tumbled marble tile ….and it’s gorgeous! So many people wanted me to add decorative tiles or color or sparkle to it. But I dug my heels in about keeping it white and plain. And, dang it, I feel vindicated looking at that picture. Remember how we rewired and hid the outlets under the cabinets? So.Much.Better. Hubby and I did all the tile ourselves and much of it was hand laid because the sheets did not fit together properly or were in awkward spaces. Although it’s hard to say which part of the kitchen makeover is my favorite, but the open shelves are definitely up there. I had to add at least a little bit of color and sunshine. I store my cookbooks, the family heirloom plant, and a few cute accessories on them. HomeGoods is my bff, ya’ll. Of course, every kitchen needs a good area for the coffee setup. Above is my menu chalkboard. The Tile Shop has been so generous to us in finding a last bit of tile to cover that back wall. They called every store in the US to find enough for our project, and pulled it together from 4 different stores. I actually intend to put a corkboard there but we want the tile behind it in case we ever change our minds. So let’s check in on the checklist, shall we? If you have any questions, let me know in the comments below! Be sure to check out the other parts of this series at the top of this post! What did you end up doing the floor as? Where did you find your backsplash? I love the look of it and the mosaic like design. It is a tumbled marble stone that we purchased from The Tile Shop. Great. Thanks for getting back to me. I will check it out. I think we have a tile shop not too far from us! Beautiful!!! I love the stone brick work on the breakfast bar. The whole kitchen looks so much lighter. Again, it’s beautiful! What are you countertops? I’m getting ready to redo our kitchen, but my husband wants to keep our wood cabinets too. I’m trying to implement the grey and keep the wooden cabinets similar to your design! We put in a granite called Blanco Gabrielle. We went through a contractor from Lowes. Interestingly, they told us that they sold it cheaper through Lowes than you could buy it off the shelf because of their contract setup. I wanted a solid surface or quartz but my husband liked the granite better since it hides bread crumbs and spills better. Also, the granite was much cheaper. His logic won out. LOVE LOVE LOVE- in the midst of upgrade similar to this. My cabinets are same and floor are similar to terra cotta tile. I don’t exactly like but my husband says the cabinet color and tile stays and I can change whatever else. Walls were BM concord ivory. I recently painted hint of grey/cremeBM white dove but now it seems almost stark. Formica counters are being changed and I love your counters and marble back splash together along with paint color- doesn’t not seem stark at all. Do you recall you paint wall paint color and trim color? Thank you so much for your kind words! I can’t stand my floors but we have to replace the entire main floor at the same time so I’m waiting on the $$$, lol. 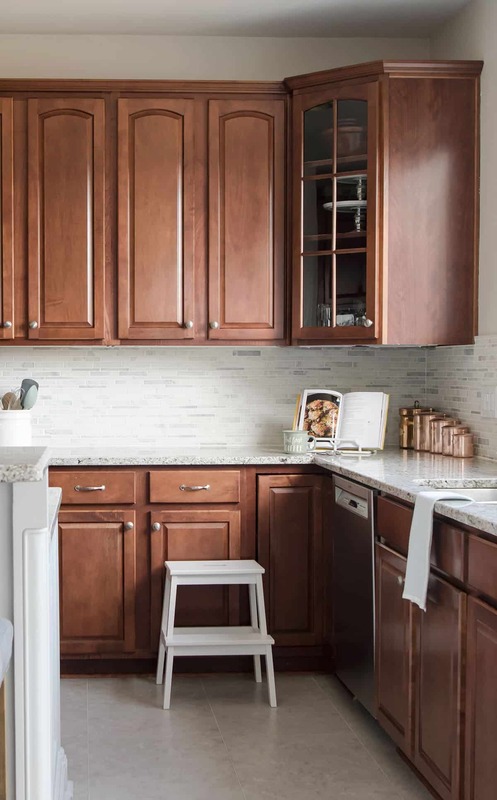 There is very little trim in our kitchen, but for the rest of the house I used a warm, almost creamy white. I have a very open floor plan so basically I took all of my paint chips together and figured out which white worked best with all of them. The paint color I used in the kitchen is called Asiago and it’s part of the heritage line from Lowe’s. 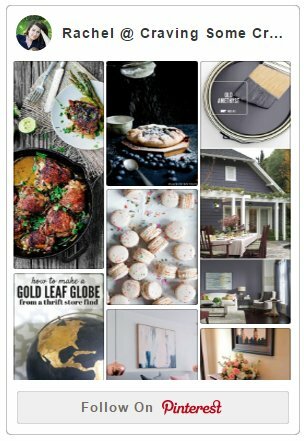 I have used a few Benjamin Moore paint colors for various projects and I would guess that “Light Pewter” is the closest to the Asiago. I haven’t used that particular color so it is more of a guess but you could take a paint sample from lowe’s to them and see side by side. To the human eye, it reads as a white but doesn’t have the starkness that you speak of. I have a lot of natural light in my kitchen so that does help brighten too. I hope that helps and I am always here to answer questions. Good luck with your upgrade and I would love to see it after it is done! Love the look of the back splash. We have a similar cabinet and counter. 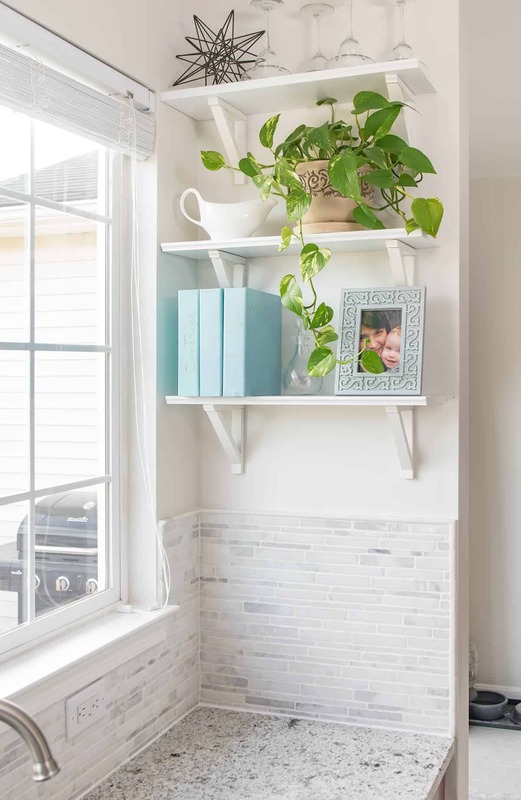 Can you tell me the name of the backsplash tile and where you got it from? I adore the backsplash! We purchased it from The Tile Shop. I believe this is the same one – https://www.tileshop.com/product/tempesta+neve+tumbled+sparta+12+x+13+in.do?sortby=ourPicks&refType=&from=Search&ecList=6&ecCategory= Now, we did have quite the saga with that particular tile. Apparently, it comes from Asia by boat and at the time, which was a year ago, they were running low on inventory in the US. We pieced together sheets from stores in Texas and Oregon (we live in Virginia). I am certainly not discouraging you, however, I recommend making sure that the store has more in stock than you think you need. We needed about 60 sq feet so that was also part of our problem. This turned out awesome! I honestly love white backsplashes. It lets you pull other colors into the room and make your accessories pop like no buddies business! The island is to die for! I love everything about your kitchen! Thanks, Jessica! 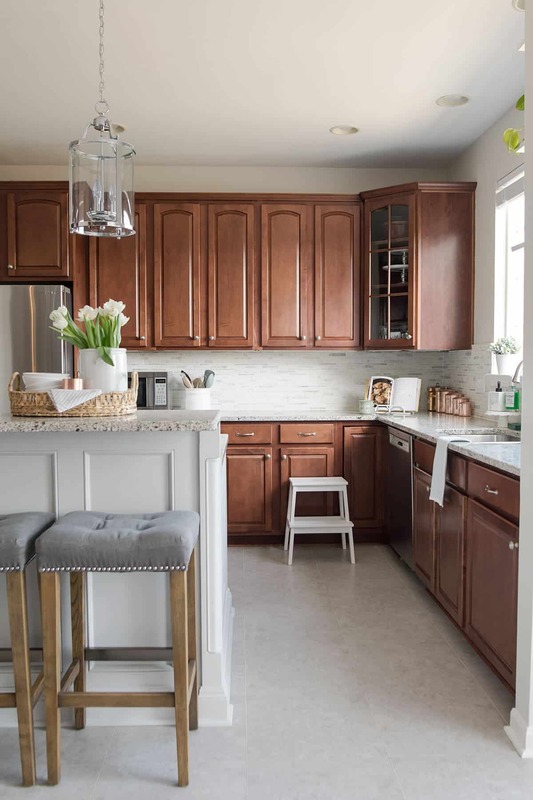 My original intention was to paint the cabinets a warm grey and although I think it would have been goregous with the white backsplash, I think the darker suits our house better. I can’t wait to rip up those floors now! 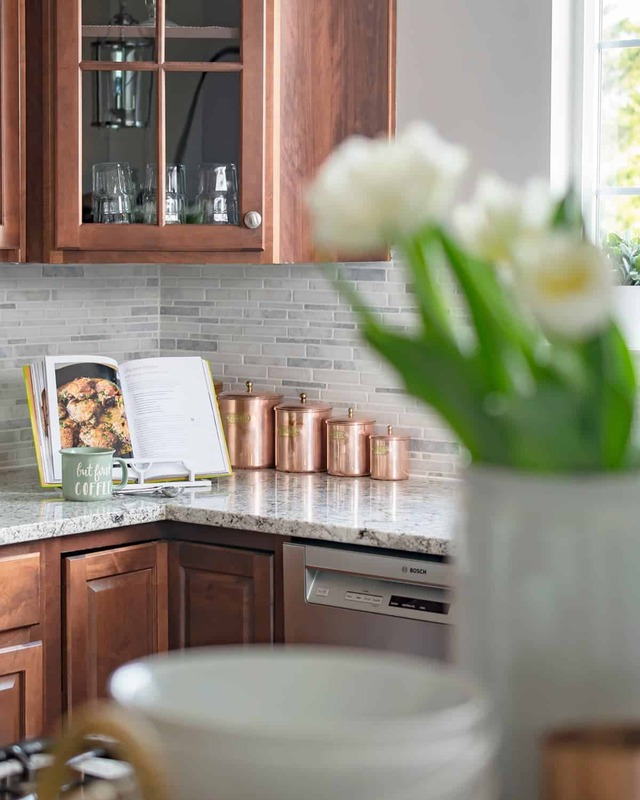 You are so right about the white backsplash giving more versatility. 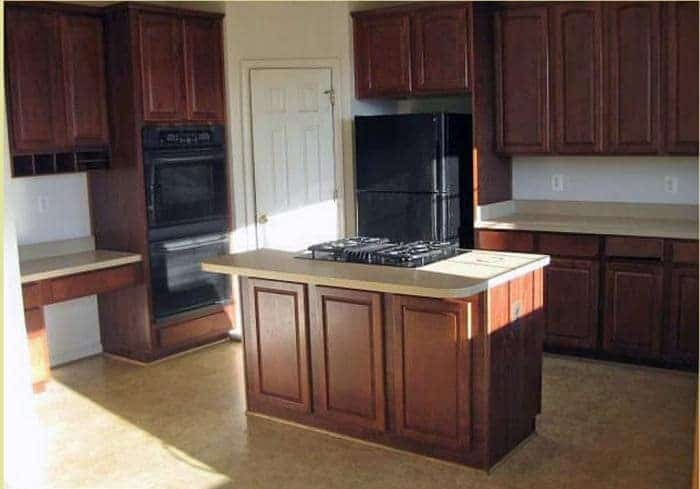 Just think of the cabinets as a part of your homes history lol. I love grey though, I painted my bathroom a darker gray color and put in grey marble tiles. It is one of my favorite places hahaha. I love how your kitchen turned out. We just bought a foreclosure last year and the kitchen is one of the main things on our list. Thank you for the inspiration and for sharing this with the Tips & Tricks Link Party! Pinned! Glad I could inspire someone! And thanks for the Pin! It was a loooong project, not gonna lie. But the results are definitely worth it. I love cooking in there so much more now. Thanks for stopping by, Leanne! Definitely going to join your link up. Thank you for inviting! Rachel, this is gorgeous!! I love all the changes you made! Thanks, Amy! So much work but so worth it. And the last bit of tile just came in yesterday. Woohoo! This looks great! Your kitchen does have a really open and airy feel to it. I love that you have great light sources in a window and patio door! Wow! Sounds like you have been busy too. Your decor sounds so interesting and cool. Now I am curious and want to see all the amazing work. We are putting the floor off because we know it will be yet another big project and since we are putting hardwoods throughout, might as well do it then. There are so many great elements here! 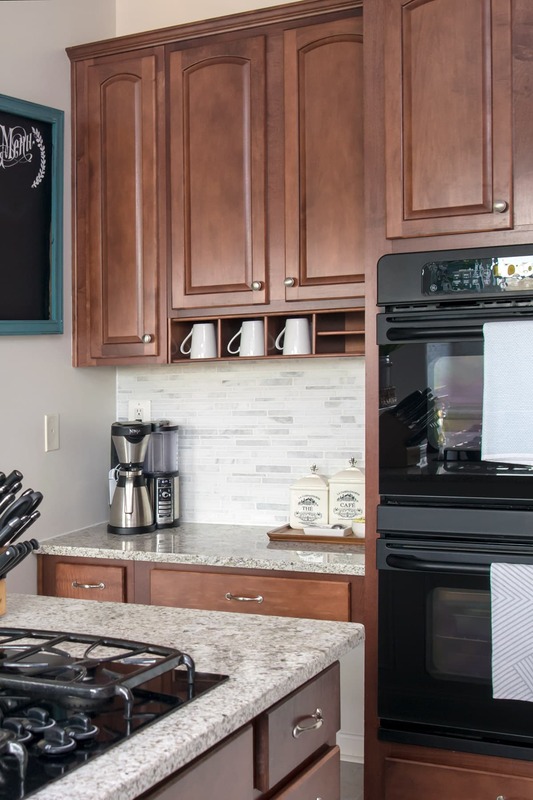 It’s hard to choose a favorite, but the back splash is definitely eye catching. Your decision to keep it white and light fits perfectly. The pops of color you’ve added with accessories work beautifully. What an awesome job. You and your husband can take a lot of pride in this project! So pretty, no, gorgeous! I wish my kitchen was large enough to do something like this in it. What I wouldn’t give for a desk area or an island, you have both! Ok, going to continue my kitchen envy over here… 🙂 Cheers! This is my dream kitchen, I will admit. In our previous horrid townhouse, the kitchen was so tiny that two people could not stand in there. The dishwasher hit the fridge door on the opposite side! This house was a foreclosure so we really lucked out but it needs a lot of work. This turned out great! I love those yellow curtains! The stone on the island was done so well. Love this! What an awesome job you’ve done! Love the open shelving too! Thee backsplash is beautiful! We just ripped out our Lino in the kitchen and tiled it! Big job but I know how you feel about wanting to get rid of it 😉 Thanks SO much for sharing with us at Your Turn To Shine! Hope to see you back again on Thurs! I am glad someone understands my craziness about the floor. It is a big job, but I think we will be able to handle it…someday. Thanks for stopping by and I love the Your Turn To Shine party. Rachel this turned out amazing!! I love the comfy, modern, open and cozy feel around it! Kudos to you for being able to incorporate all of that into it. The tiling is amazing and I am impressed you hand laid it all. Congrats to your and husband on creating this wonderfully creative and beautiful space! Thank you so much for all your well wishes, Jen! Getting this monster done on any sort of timeline has been amazing and stressful. I was going to take a break from major renovation after the kitchen. However, I seem to have finally found the perfect cabinet set on Craigslist for my craft room/home office. Oh well, more big projects! What a difference! It looks so much lighter and brighter. Love the pops of yellow and aqua too! Call me crazy, but I actually don’t mind the floors lol. I guess that’s the queen of cheap in me! I’m sure the tile you end up doing will make it look even better though. Thanks, Amanda! The floors didn’t look as bad in the old kitchen. It’s mostly the color that I dislike rather than them being linoleum. I am on an anti-beige kick, lol. I am probably going with a medium-light grey, maybe a tiny bit lighter than the stone bar. But it’s a while off, I may change my mind again! Wow, Rachel! It looks fabulous! You have to be proud. Knocking off that list and making everything feel and look so much brighter is quite an accomplishment. Congratulations on such a great job! I am proud! I admit it really took some thought about how to make a kitchen with dark cherry cabinets feel lighter. Hubby and I started work on rewiring the desk area so it should be done soon too! We’re moving soon and the kitchen has fairly dark cabinets in the new place, I’ve always had white so wasn’t at all sure, but I love how bright and airy your kitchen looks even with the darker wood. Great inspiration. Thank you so much, Julie! My husband and I had almost opposite styles in taste for the kitchen. Keeping the cherry cabinets was what my husband really wanted even though I initially dreamed about painting them. I am actually surprised at how much more cheerful and light the kitchen was (and I am so pleased!). Congrats on your new kitchen! It looks great! I LOVE that stonework on the island! That looks absolutely amazing. And I can’t believe you did the tile work yourself, that must have been SO much work – looks incredible! The stonework on the island is actually a stick on faux stone called Airstone. It was so easy to work with. The tile was a ton of work making sure all of those little pieces stayed level but I wouldn’t have it any other way. It was my favorite tile by far! Gorgeous! I love that island and backsplash. And I would love to have hidden outlets. That’s going on my “someday” list. Thanks, Meredith! The hidden outlets are such a bonus. I know it seems like a little thing, but I love that the backsplash is far less interrupted now. Excellent job on the tile!! The kitchen looks beautiful. Rachel, love the new kitchen, Congratulations!! I’m sure walking into that lighter, brighter space every morning is a joy and knowing you did it yourself makes it all the more satisfying. You are right on both, Susan! Now if I can just keep it clean. That would be a miracle I think, haha. LOVE the kitchen!!!! Those little mason jar storage containers are cute, too! I really want to remodel our kitchen… I wanted to this year, but we may wait a year. I know what you mean. Busy busy bees we are. I have more projects than I have time for, lol.